M193 | 963 m. | 3160 ft. The Corryhully Horseshoe had long been on our list of very desirable hill walks in Alba. Maybe not as grandiose as the Ring of Steall or Sgurr na Ciche but nonetheless some tour to look forward to very much. 12 June 2016 saw us go about fulfilling that plan. It was a warm day and the midges were already showing us some attention when we prepared our kick-off for the day at the parking beside the River Finnan in Glenfinnan Village. Off we went and quickly reached the viaduct which I had last seen, when Birgit, Stephanie and I had visited the eastern Munro of the Horseshoe in 1998. Harry Potter films had then not been known and the viaduct had not acquired its present notoriety. Of course progress was swift and easy. The glen is beautiful and so is the meandering River Finnan. After 45 minutes we crossed the Allt a Caol Ghleann and passed Corryhully Bothy. There the Landover track becomes a little steeper and we gained some height as we progressed another kilometre. Then, however, the cairn indicating the start of the ascent of Sgurr nan Coireachan’s steep and rocky southeast ridge appeared to the left. We deposited a bottle of water for the return leg of the hike and commenced the long climb towards the Sgurr. The path is rather well-engineered and there was some material left beside it which indicated that maintenance work had been done. Somebody had even left a wheel barrow there. Rising first gently and then after a major bend more pronouncedly the path climbed over several rocky steps in the ridge which took turns with slightly more level grassy sections. Soon the terrain got more and more rocky. At a spot where the path leaves the crest of the ridge to climb a few dozen metres to the west of Sgurr a’Choire Riabhaich some slightly exposed minor scrambling was called for and the very steep section of the path called for more attention as to where you put your boots. All this ended at the summit of Sgurr a’Choire Riabhaich (852m). From there the climb towards the first Munro of the day was straightforward if steep and rocky in sections. A very delightful final 100m before the summit and trig point appeared in the clouds which sadly engulfed all the terrain above 800 metres. What can you do? Frank and I had split up our party of two before the summit. He was to carry on towards Sgurr Thuilm to complete the circuit. I wanted to retrace my steps back by the way of ascent. We would meet at the spot by Landover track where we had deposited the bottle of water. I had a longish summit break chatting away with a few other Munro baggers who were doing the Horseshoe either clockwise like us or counter clockwise. I then walked back the three kilometres to the glen via the fine ridge of ascent and waited for Frank who meanwhile completed the whole horseshoe bagging the second Munro en route. 40 minutes after I had reached the Landover track I could see Frank come down the path on Druim Coire a’ Bheithe. Another 10 minutes later Frank sat beside me on a boulder by the track and took long sips of water from our spare bottle. I re-laced my boots, we took our rucksacks and strolled back towards Glenfinnan via beautiful Glen Finnan. One or two short pauses to take in the scenery were called for but did not slow us down very much. I remember that in 1998 the return hike from the foot of Druim Coire a’ Bheithe to the village took Birgit and me hardly more than one hour. We were young, then :-). Today it took Frank and me a little longer but that was mostly due to us not being in a rush. YOLO and why the heck should we hurry? So? This was a fine day on two fine hills. The southeast ridge of Sgurr nan Coireachan is a fine example of steep and rocky terrain reminiscent of Knoydart. The horseshoe is great indeed. The views from the tops were moderate only. But that was the only drawback to an otherwise great day which was later topped off by Germany beating Ukraine 2:0 in the EURO2016 football tournament. 1998 Clouds at 850 – 900 m all day. Good hiking conditions. From parking at the beginning of private road to Glen Finnan Lodge on A830 past the lodge to the foot (7km from starting point) of Druim Choire a’ Bheithe. Up that ridge, steep at first but easing out further up. 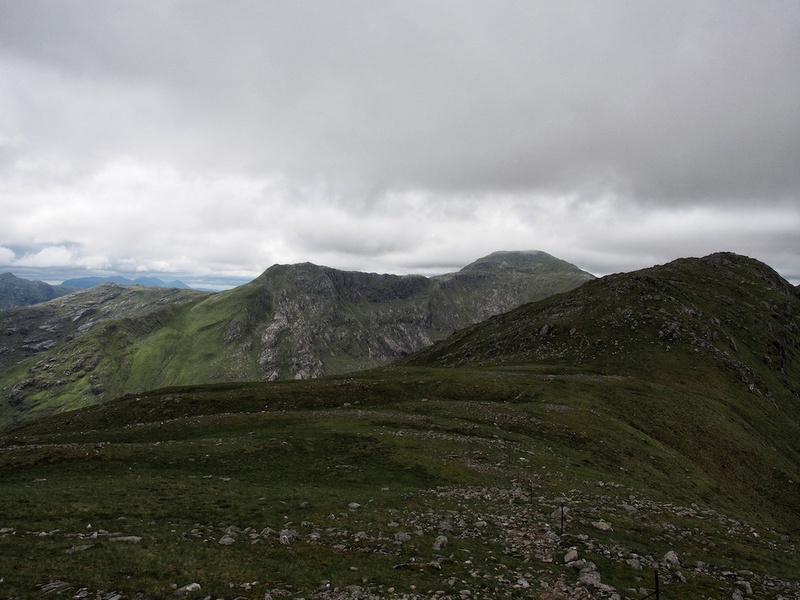 (Stephanie went up to the beallach between Streap and Sgurr Thuilm and did not go up to the summit). Last kilometer ridge turned west-north-west. Summit in clouds. Nil visibility. Return by route of ascent. Easy hill but longish approach walk on tarmac. Good weather and the hole horseshoe would be fine. Description These two mountains stand at the head of Glen Finnan, about 7 kilometres north of Loch Shiel. Together with their subsidiary tops, they form an undulating ridge enclosing Coire Thollaidh, in which the River Finnan has its source. The north side of the ridge between Sgurr Thuilm and Sgurr nan Coireachan is even rougher than the south side, and there are some wild corries above Glen Pean on that side of the ridge. It is possible to approach these mountains either from Glen Finnan to the south, or from the end of the public road at the west end of Loch Arkaig to the north-east. The Glen Finnan approach is slightly longer, but it is possible to cycle a few miles up the glen.Leave the A830 road on the west side of the River Finnan and go up the road in Glen Finnan to Corryhully and continue for a further 1 kilometre. At that point follow a stalker's path north onto the south-east ridge of Sgurr nan Coireachan. Climb this ridge up its crest, which is rocky in places. From Sgurr nan Coireachan traverse east along a rough ridge which goes up and down over Meall an Tarmachain and Beinn Gharbh and finally climbs to Sgurr Thuilm. Descend south and then south-west down the Druim Coire a' Bheithe to reach the track in Glen Finnan.